Ever since we first started developing professional audio equipment in the 1960’s, we've made it our goal to stay at the forefront of the technology curve. Drawing on decades of experience as a true industry innovator, we don't merely utilize cutting-edge technologies.we create them. With the express purpose of making the most powerful and reliable high-resolution speakers possible, we assembled a specialized team of Yamaha's most skilled engineers to examine, and improve on, every detail of loudspeaker design. This passion for innovation served as the impetus for an intensive collaboration with loudspeaker giant NEXO, adding their insight and expertise as an industry leader in touring-grade sound reinforcement to the development of our DSR, DXR and DXS Series speakers. As a result of working closely with NEXO's engineers at their state-of-the-art facility, our team adopted a new approach to some crucial aspects of these speakers’ design. The detailed analysis of the transducers, thorough testing of the enclosures' acoustic properties and optimized limiter setting all contributed to higher SPL delivered with stunning clarity and an unsurpassed level of reliability. By incorporating touring-grade technology into these speakers, we've succeeded in creating the most powerful and dependable high-performance, active loudspeakers...ever. Performance runs in the family, and like the acclaimed DSR Series before it, DXR Series loudspeakers offer superb high-definition sound and class-leading sound pressure levels—yet in a more compact and extremely functional design that provides a level of versatility unmatched by any speaker in its class today. The DXR Series is comprised of four full-range models perfectly suited for front-of-house sound, monitors, simple amplification, rigged applications and more. Combining the series with our newly designed DXS subwoofers will further elevate your system's performance, giving you versatile control of its thunderous bottom end. With the perfect balance of raw power and innovative speaker technologies, you can depend on DXR Series speakers to deliver the full power of your performance to every member of your audience. Our development team took full advantage of a number of advanced digital technologies, both new and refined, based on Yamaha's extensive experience accumulated over many long years of developing professional audio equipment. Everything from the detailed management of crossover, EQ and time alignment to the limiter settings, protection functions and precise dynamic control of the sound, was subjected to endless simulation, in-house and field testing to ensure that these speakers produce the highest level of sound quality at the highest output levels possible. Combined with Yamaha’s advanced analog signal processing and acoustic technologies, the “Power of “D” delivers ultimate performance. All full range models feature Yamaha's proprietary FIR-X tuning™ utilizing linear phase FIR* filters for the crossover network. FIR-X™ tuning simultaneously optimizes frequency and phase response while adjusting the time alignment between the HF and LF transducers. This creates a very smooth response around the crossover point, providing much better clarity and imaging than what is possible with typical crossovers. All signals are precisely processed by a 48bit (76bit accumulator) high-performance processor for high definition sound quality. All full-range models employ high-precision 24bit discrete A/D and D/A converters with superior S/N ratio and dynamic range. D-CONTOUR is an intelligent multi-band compressor that gives you powerful and consistent sound throughout all output levels. By constantly monitoring the output of multiple frequency bands and calculating the optimum EQ adjustments for each, even the maximum sound output maintains outstanding clarity and musicality. With the DXR Series, D-CONTOUR provides a more detailed tuning of your sound with two different settings: FOH/ MAIN mode or MONITOR mode. FOH/MAIN mode boosts low-frequency to compensate for low-end that is typically missing when speakers are used in suspended applications or mounted on a speaker stand. MONITOR mode is completely optimized for floor monitor application by intelligently taming down the low-frequency that adds up due to floor reflection, smoothing out a wide range of frequency bands to give you stunning clarity for monitoring your sound. Both of these presets were perfected by performing countless listening tests with skilled sound engineers, giving you a multi-band compressor that performs dynamically, delivering consistent sound with low distortion at any output level. In a typical system comprising passive loudspeakers, power amps and signal processors, trying to match optimal parameters for each component can be a daunting task. 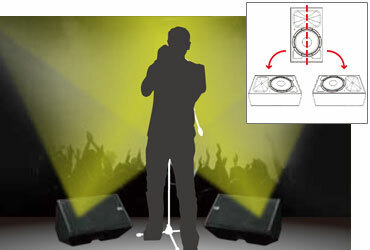 One of the advantages of active loudspeakers is that the combination of transducers and amps can be perfectly optimized. During the development of the DSR, DXR and DXS series, we measured and tested the durability of each transducer and the overall amp output through countless indoor and outdoor listening tests. Based on the test results, we were able to set the optimal limiter point for each model using precise DSP control. In addition to the optimal limiting, our speakers employ many of the same protection functions used in our top-class TXn Series professional power amplifiers. A microprocessor and high-power DSP monitor the status of the power supply, power amplifiers, transducers and ongoing signals to protect all aspects of each component. As a result, these speakers can perform to their full potential while ensuring reliable operation in even the most severe conditions. - Switchable White Front LED Each of the full-range models and DXS speakers has a white LED behind the front grille that illuminates when powered and varies in brightness depending on the amount of system limiting. - All-New Compact, High-Power DXR Amp Modules All DXR Series loudspeakers are equipped with highly efficient Class-D amplifiers that were optimally designed to match the DXR's HF and LF transducers. These high-performance amplifiers deliver the highest sound output in their class with 1100W of power, producing an impressive SPL up to 133dB. They also provide very fast attack and superior transient response, which greatly contribute to these speakers' incredible audio performance. - Universal Switching-Mode Power Supply The DXR Series employs an all-new, high-efficiency switching-mode power supply for its outstanding performance. 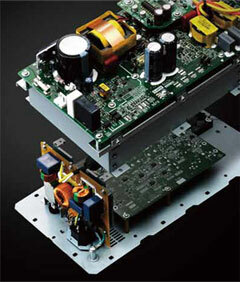 The power supply is also suitable for use worldwide with its multi-voltage design. The DXR Series features a flexible onboard mixer with a variety of input, making it ideal for simple vocal/ instrument amplification. With its flexible IN/OUT, the DXR Series can comprise a full sound reinforcement system, or seamlessly integrate into a setup utilizing DSR or DXS Series speakers. - Versatile Mic and Line Level Input Capability The DXR onboard mixer can handle up to three simultaneous inputs. It accepts both Mic and Line level input, giving you the flexibility to connect to a variety of sources from microphones to line level instruments and portable audio devices. 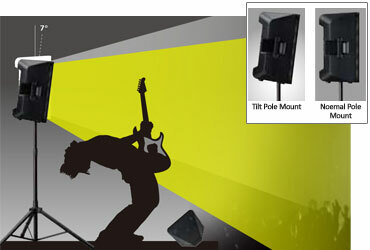 When in MIC position, a HPF is automatically activated to roll off unwanted low frequency. 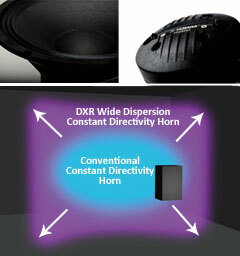 - Flexible HPF Control All DXR loudspeakers feature flexible HPF control to perfectly match with DSR and DXS subwoofers. You can choose either 100Hz or 120Hz depending on which subwoofer you are using in combination with the DXR. DXS Series subwoofers feature flexible LPF settings allowing you to find the optimal HPF/LPF balance for your sound. - Smart Mixing / Linking Function Each channel has an individual volume control, letting you mix three discrete audio sources. THRU out passes the input signal from Channel 1 and LINK OUT sends mixed signal from all channels.ideal for daisy-chaining or routing the signal to another destination. LINK OUT is very useful for configuring a compact SR system with another DXR, while LINK MODE allows you to easily switch between stereo or dual-mono configurations. - Custom-Designed DXR Transducers All DXR Series transducers were meticulously selected and thoroughly customized to deliver ultimate performance. The detailed characteristics and behaviour of each transducer was fully analyzed and evaluated with sophisticated computer simulations in order to help realize their full performance potential. The high power output woofers deliver very low distortion and defined, deep bass, while the 1.4” precision compression drivers produce accurate midrange and high frequencies up to 20 kHz. - DXR Wide Dispersion Constant-Directivity Horn The HF transducer is mounted to an all-new 90°x 60°constant-directivity horn, designed with the goal of minimizing radiation pattern deterioration in oblique directions as more conventional horns are prone to doing. This can help to achieve a more ideal coverage area without irregularities. With the new wide dispersion constant-directivity horn, sound expands in a more rectangular pattern providing 90° horizontal x 60 °vertical coverage, with wide-frequency sound projected to the edges of the coverage area. Full-range models are moulded in rugged, non-resonant ABS enclosures and are designed to dampen down vibrations caused by high output levels, producing less distortion and superior sonic quality. The road-tested enclosures are equipped with heavy-duty steel grilles and ergonomic, gripped aluminum handles that greatly improve durability and portability. The DXR12 and DXR15's enclosure design enables mirror-mode monitor placement that creates a symmetrical sound field for the performer with a larger, more defined “sweet spot”. Used in either a balanced dual-mono configuration or a stereo monitor mix setup, mirror-mode floor monitoring can enhance your performance considerably. Depending on the venue, sometimes your mix can fall prey to low ceilings or other room attributes that can impede a clear, even mix and detract from the audiences' listening experience significantly. The DXR's pole mount socket offers two positions—0° and 7°—to direct the acoustic energy away from reflective surfaces and on to your audience where it belongs.